Throughout the year, teams of 8 to 15 people get together and fundraise to support the work of Cancer Research UK. In Colchester on the 28th July 2018 we all join in an inspiring overnight celebration and commemoration. During the weekend of Relay For Life Colchester you can expect a celebratory mix of music, games, entertainment, food and perhaps a few surprises! Whilst the event is in full swing, members of each team will take turns to walk around the track for the duration of the Relay. 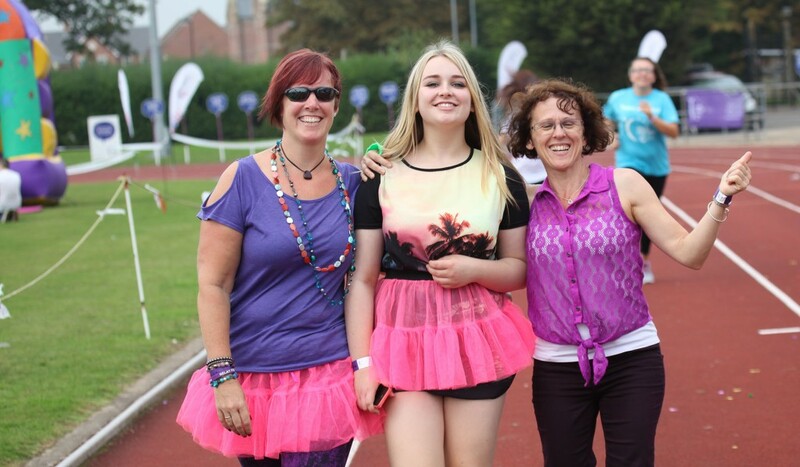 By joining us for Relay For Life Colchester you have become part of something special. Every Relay For Life begins with an inspiring Lap of Honour. Cancer Survivors walk the first lap at 11 a.m. cheered and supported by the community. If you know any Survivors that we can honour as our guests please let us know. Throughout the day each team may provide an activity to entertain the general public and hopefully also bring more into our funds. On stage there will be a wide mix of music and entertainment. We shall stop walking briefly for the Candle of Hope ceremony which is a poignant part of our Relay. As darkness falls, dedicated candles are lit and we honour all those whose lives have been touched by cancer. A minute silence, a poem and quiet circuit of the track as we all remember those who have waged war with cancer. Throughout the night, a member of each team continues to walk, enlivened by the silent disco. When morning comes we will be sustained by our breakfast and we walk to party music as we celebrate the lives saved from cancer. As the clock approaches 11 a.m. everyone joins the walk, preceded by our Guests of Honour – our Survivors. It is then time to strike camp, head home for a rest and start planning for next year!